Selecting the right radar detector can make the difference of getting a ticket, or not getting a ticket. Because of this we have developed our rating system ranking detectors into five categories. 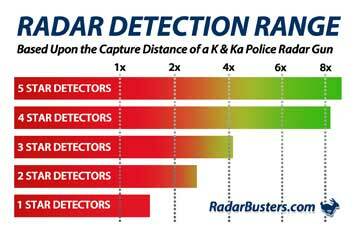 The detectors we rank in our five and four-star category have 8 times capture distance of a constant on police K and Ka radar gun. The detectors in our three star category have four times the capture distance. And the detectors we rank as one star have the same or in some cases less then the capture distance. Now trying to explain all this technology stuff to someone not familiar on how police radar works can be difficult at times. Now please realize one important thing, this test you’re about to witness only compares the performance of these detectors during an instant on K-band encounter, not an instant on encounter. Because of this I would also recommend that you watch our instant on review video, which I will provide you with a link at the end of this video.